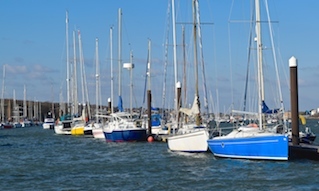 The primary objective of the Cowes Breakwater Project, part of the Cowes Outer Harbour Project, is to transform Cowes into a true sheltered harbour. Phase 1 of the Outer Harbour Project, construction of the new detached Cowes Breakwater, began in May 2014. 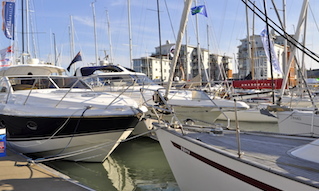 Following a tender process, in consultation with Project Managers Atkins, Cowes Harbour Commission (CHC) and their partners at the Homes and Communities Agency (HCA) appointed Boskalis Westminster on a design and build contract. This is a £7.5m project including a fixed price contract of £7m with Boskalis Westminster; funding being from the HCA providing £3m of inward investment and CHC contributing the remainder of the cost. The initial construction phase was completed in October 2014, at which point the gravel core was visible approximately 4 metres clear of Low Water spring tides. Following a winter settlement period, Boskalis returned in February 2015 for a week of re-shaping work. In July 2015 Boskalis mobilised for the final stage of the breakwater build. This involved bringing the slopes of the core into profile and the placement of rock armour protection. The final phase of construction, the placement of rock armouring layers, was carried out in autumn 2015, giving a 350 metre long, detached rock armoured breakwater that protects existing homes, businesses and harbour users and that enables the continued regeneration of East Cowes and the further economic benefits that brings to the Island. 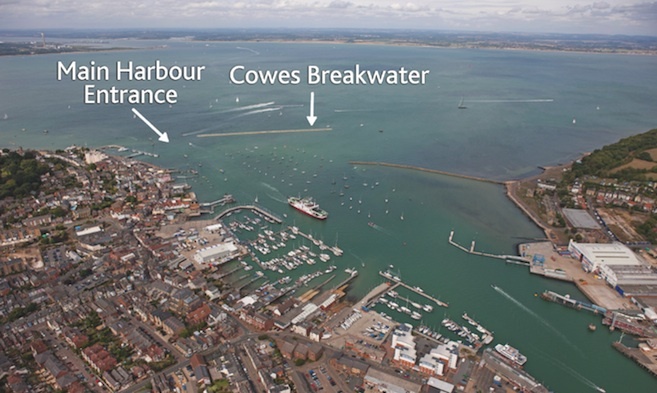 Construction of the new detached breakwater for Cowes began on 17th May 2014. An initial 1.5m layer of sand and gravel was first installed in May 2014. A series of wick drains (11,000 in total) were installed. A geotextile membrane was laid on top of the sand and gravel layer. The gravel pre-load was installed up to between 4 and 4.5 metres above chart datum. The gravel core was left to settle during September 2014. 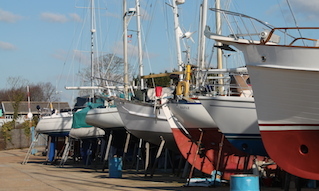 Five settlement beacons were installed on the breakwater core. During October 2014 the breakwater core was reshaped up to 4.6 metres above chart datum using gravel stored on the breakwater sides. A consolidation process took place over the autumn and winter of 2014-2015, to allow for settlement of the gravel core along the breakwater footprint and increased load bearing capacity of the subsoil. Following the winter settlement period, Boskalis returned in February 2015 for a week of re-shaping work on the gravel core. As part of the February works, Boskalis also carried out further surveys and determined that settlement of the core material into the subsoil is as predicted and in accordance with construction plans. Boskalis Westminster mobilised in July 2015 to commence the final reshaping of the breakwater’s gravel core, bringing sections into profile before applying layers of smaller rock of up to 60kg that act as a filter to prevent the gravel migrating out of the core structure. Following this, a rock armour layer consisting of 300-1000kg rocks was installed to provide long-term weather and wave protection. A total of around 45,000 tonnes of rock was brought from Cherbourg in France and transported by barge to Cowes. The rock barges were unloaded by excavators and shovels on the western end and northern side of the breakwater. Excavators located on the breakwater positioned the rocks working anti-clockwise, starting on the southern face working to the east and then back along the northern face to the west, bringing the breakwater to its final profile and finished appearance. Contractors Boskalis Westminster finished the rock armouring of the new Cowes Breakwater in autumn 2015. On 1st March 2016 the Breakwater Exclusion Zone was removed and temporary navigation buoys instated to mark the surplus gravel store; see Local Notice to Mariners No 24(T) for full information. 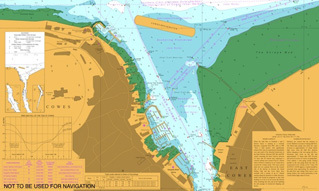 See the section: Eastern Channel and Shrape Breakwater extension.